April has not been kind, it rarely is here, but this year it seems particularly unkind. We have had 21 days of rain, a total of 152 mm (6 inches), and a couple of light falls of snow; the average overnight temperature has been a mere 2℃ and we have had frosts on nine days. The greenhouse has fared better with an average low of 8℃ and reaching 20℃ most days, if only for a few hours. The daffodils and tulips don’t seem to mind though. 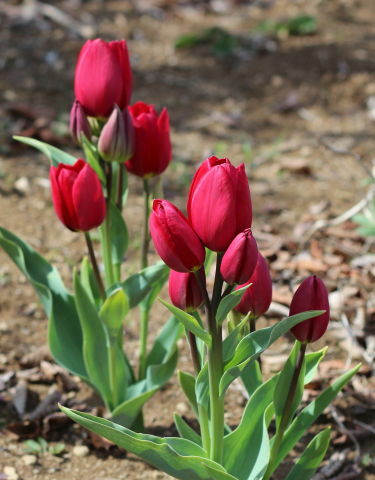 This beautiful tulip is ‘Red Georgette’. “Is this fair, my little ones, is this fair? So, how is the salad challenge fairing through all this? 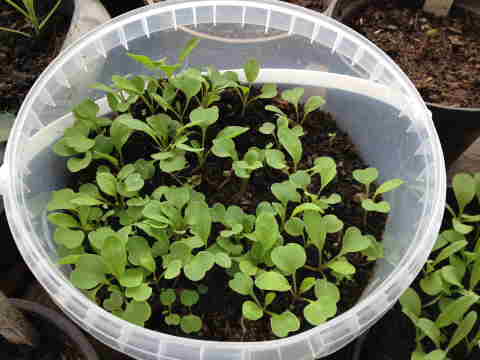 Many weeks ago I sowed lettuce and spinach seeds under the staging in the greenhouse in the hope of having something fairly quickly to add to the very limited supply of mizuna and mustard that survived the winter. The lettuces germinated quickly, looked around, clearly didn’t like what they saw and promptly keeled over. The spinach germination rate was poor but at least they didn’t die, unfortunately they didn’t grow either, just sat there being nibbled at by something. Lesson learnt: the soil at ground level in the greenhouse is nearly as cold as that outside. Then I read a blog post by someone (unfortunately, I have forgotten who it was so I cannot give them credit) who had success growing salad in an old washing up bowl, so now I have an old fatball container packed with mixed lettuce seedlings and a washing up bowlful of black kale, the spinach survivors from under the staging and a few celery leaf seeds. 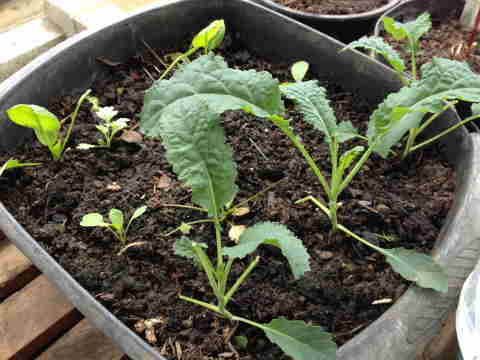 I intentionally over-sowed the lettuce seeds and the thinnings give an intense kick to salads, and I love the flavour of raw young kale leaves. The spinach is thankfully starting to recover. 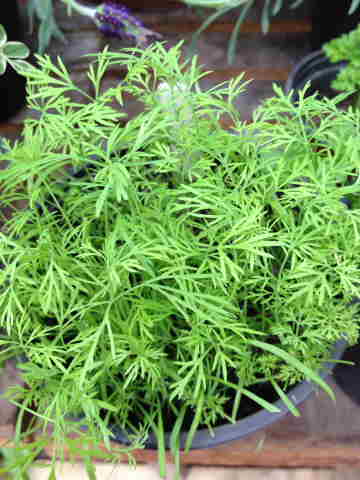 The parsley seedlings that I grew on the window sill back in early March are now in the greenhouse and large enough to harvest a few leaves occasionally. A couple of times I have nearly picked Amni Majus leaves by mistake, the seed leaves look very similar (it is only an up-market cow parsley, after all!). The coriander is romping away now and I have risked putting some outside under cloches made from five litre water bottles to protect them from the wind. I also have a mini dill forest in a pot. It looks so pretty and feels so soft and wafty that I just have to let my hand roll gently over it as I pass. It doesn’t seem to mind . Alec: “I like the dressing”. This salad challenge thing is most definitely still a work in progress! This entry was posted in 52 Week Salad Challenge. Bookmark the permalink. Men & salads don’t really mix ! You made me smile ! No salads on Mars, eh! Glad I made you smile. Really love those tulips: great colour and a good number of blooms too! Thanks F&F, I love them. This year’s stars. Hi Michelle, dill and horseradish? I wouldn’t have thought that would work and no, Alec doesn’t like mustard or horseradish, too hot! He’ll have to go. I so agree about the way we are sharing each other’s stuff, it is so nice. Good luck with the watercress. I thought that when I saw it being made, but it was fab when I had it later served with smoked trout. It’s like tartare sauce (which I love) with some bite. But then I love horseradish and the way it makes your nose tickle when you’ve had slightly too much! Michelle: I will have to try the dill and horseradish. Yes, love the nose tickle but not the nose burn if you breathe too deeply as you chew! By the way, I meant to apologize for not including any references back to your blog and the Challenge – I was having dreadful problems with WordPress and the laptop’s battery was running out. Bloody hell! You are doing well. My salad ‘bowls’ have rarely taken off, my coriander bolts almost immediately after it’s sown and I’m not desperately successful with dill either. Arabella: you have no idea how good that makes me feel, thank you. I think the answer to dill in a pot is to absolutely flood fill it so they all hold each other up. It is just so fragile but I love it. Its flowers look great in a vase too. As for coriander,I have stopped worrying about it bolting since it is going to do it anyway, I let it and collect the seeds which are so much nicer than shop bought and just keep sowing it. Margaret: Alex likes most things I cook, so I can’t complain too much. Coriander is always going to run to seed, I just collect the seeds (carefully!) which taste wonderful compared to shop bought and reduces the amount of self-seeding. Seems to work for me. I do hope you still have some tulips left when you get back and email me and we will arrange a get together. Dill – oh I forgot to plant dill. Not too late to correct that! Happy gardening to you,too, Lea. I’ve just been nominated for the One Lovely Blog Award, as you can see if you link to http://margaret21.wordpress.com/2012/09/01/one-lovely-blog-award/ In my turn, I’d like to nominate your blog. You’re under no obligation to nominate any blogs in your turn, but please do if you’d like to. The ‘rules’ I was asked to adhere to are at the bottom of my post. I so enjoy your blog, and I’m glad to have the chance to say a public ‘thank you’. Thank you, Wendy, I think I am fortunate to have an intuitive feel for gardening, probably helped by years of watching Gardeners’ World when I didn’t have a garden! And you have reminded me that I still haven’t read any of your books – I must put that right. Thank you for visiting and I hope you enjoyed this post and will come back again. I like to read your comments and I try to answer them all.